Intel is clearly tired of Nvidia and AMD kicking sand in its face when it comes to graphics performance. The company has had a talented GPU engineering team for many years. With the fourth generation of Intel’s Core CPU line those engineers finally get to strut their stuff. 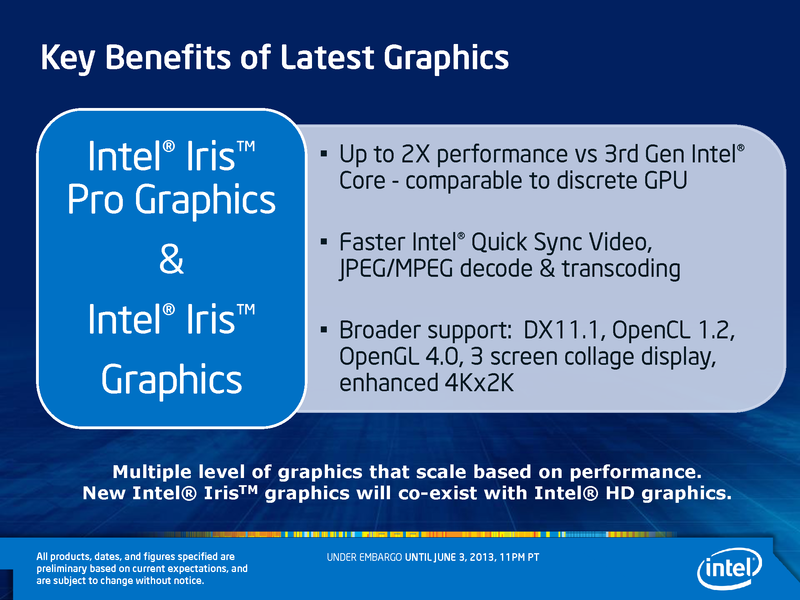 And Intel has launched a new brand to mark the occasion: Iris. Intel claims that the Iris Graphics 5100 and Iris Pro Graphics 5200 GPUs integrated into some of its Haswell SKUs deliver as much as twice the 3D performance of its existing integrated graphics processors. Intel is claiming 3D performance on par with Nvidia’s GeForce GT 650M, a discrete mobile GPU found in high-end notebooks with credible (not high end) gaming performance. Iris and Iris Pro GPUs support advanced APIs, including DirectX 11.1, OpenCL, and OpenGL 4.0. DirectX 11.1 is very important for delivering all the best visual effects in modern games. Photo- and video-editing programs, such as Adobe’s Photoshop and Sony’s Vegas Pro, use OpenCL to tap a graphics processor so they can render images faster. And engineering, design, modeling, and animation programs such as Autodesk’s 3DS Max rely on OpenGL to talk to the GPU. Intel's best integrated graphics processors look promising, but you'll find them in relatively few desktop and mobile SKUs. 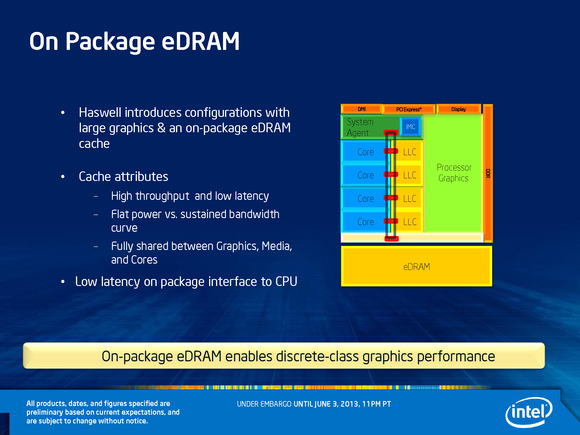 Iris graphics will be available only on a limited selection of fourth-generation Core CPUs, however, and they aren’t in any of the fourth-generation Core processors designed for Ultrabooks. The U and Y series CPUs announced to date have Intel HD Graphics 4200, 4400, or 5000 integrated GPUs. The Iris Graphics Pro 5200 is built into Intel’s most powerful mobile CPUs—the Core i7-4950HQ, Core i74850HQ, and Core i7-4750HQ. When we ran 3DMark’s Firestrike gaming benchmark at resolution of 1920 by 1080 pixels, we found Intel’s Core i7-4770K (equipped with an Intel HD 4600 integrated GPU) to be 32 percent faster than its predecessor, the Core i7-3770K. But it was eight percent slower on this benchmark than AMD’s best processor, the A10-5800K. On the other hand, Intel’s chip wiped the floor with the A10-5800K on nearly all our other benchmarks.